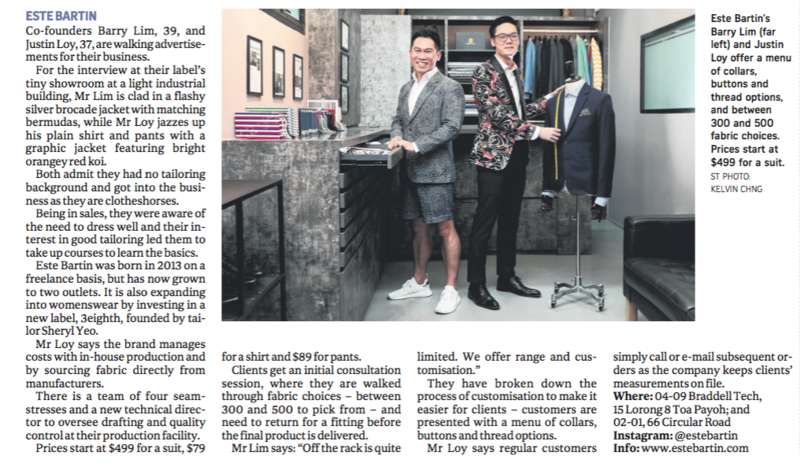 Co-founders Barry Lim, 39, and Justin Loy, 37, are walking advertisements for their business. 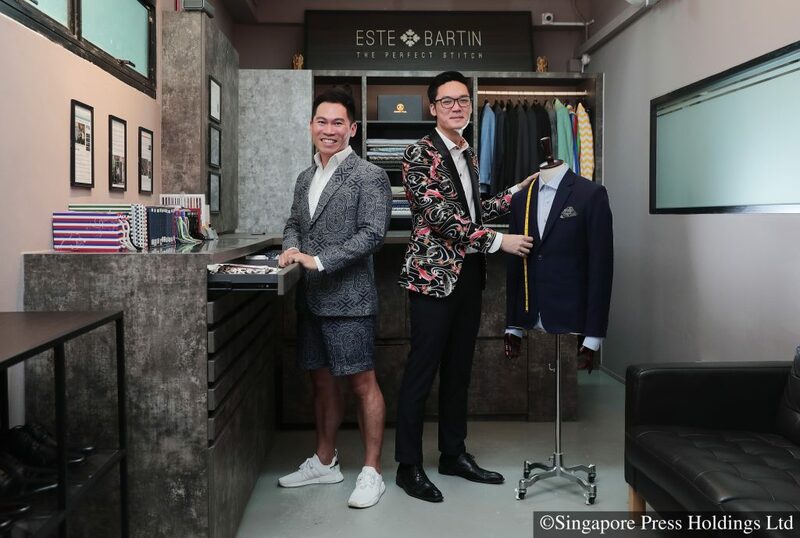 For the interview at their label’s tiny showroom at a light industrial building, Mr Lim is clad in a flashy silver brocade jacket with matching bermudas, while Mr Loy jazzes up his plain shirt and pants with a graphic jacket featuring bright orangey red koi. Both admit they had no tailoring background and got into the business as they are clotheshorses. Being in sales, they were aware of the need to dress well and their interest in good tailoring led them to take up courses to learn the basics. Este Bartin was born in 2013 on a freelance basis, but has now grown to two outlets. It is also expanding into womenswear by investing in a new label, 3eighth, founded by tailor Sheryl Yeo. Mr Loy says the brand manages costs with in-house production and by sourcing fabric directly from manufacturers. There is a team of four seam- stresses and a new technical direc- tor to oversee drafting and quality control at their production facility. Prices start at $499 for a suit, $79 for a shirt and $89 for pants. Clients get an initial consultation session, where they are walked through fabric choices – between 300 and 500 to pick from – and need to return for a fitting before the final product is delivered. They have broken down the process of customisation to make it easier for clients – customers are presented with a menu of collars, buttons and thread options. Mr Loy says regular customers simply call or e-mail subsequent orders as the company keeps clients’ measurements on file. © 2019 Este Bartin. All Rights Reserved.